Massey University leads New Zealand in the areas of mechatronics and robotics. The Master of Engineering Studies (Mechatronics) is part of the most well-established offering of mechatronics within New Zealand and our staff have many years working experience in these areas. The Master of Engineering Studies (Mechatronics) is unique as an upskilling and staircasing qualification for international candidates looking to enhance their current qualifications. Within a New Zealand context the endorsement is unique due to the connection of Massey University to local and global companies and research opportunities. Massey University leads New Zealand in the areas of mechatronics and robotics. We have the most well-established offering of mechatronics within New Zealand and our staff have many years working experience in these areas. You will gain advanced knowledge in research methods, mechatronics, robotics, additive manufacturing and system design and integrations through the taught element of the qualification. You will then have the opportunity to develop these further in a postgraduate project. As a mechatronics student you will have total access to the Centre for Additive Manufacturing. Within the centre you have access to the latest 3D printing and rapid manufacturing technologies, including testing equipment. Massey offers a much broader range of courses in this qualification than almost any other similar international offering. You may choose to focus on specific areas such as product development, quality systems or industrial management. Or you can develop your skills across the full spectrum of these areas. This qualification is focused on real world application, helping you to better understand the commercial environment and how you can utilise research outcomes to make real change or develop new systems, services or products. In your research project you will work with real companies on the problems they face. This is a real world opportunity to apply your knowledge and further your learning in a commercial environment. The Master of Engineering Studies is a high-quality programme, combining taught and research courses at a postgraduate level. It is a 120 credit qualification able to be completed in one year full time. Dr Potgieter has a well-established international reputation for his work in educational robotics. He has been inducted into the World Robotics Education and Competition (REC) Foundation Hall of Fame. 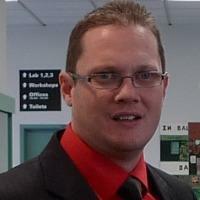 He is Director of the Centre for Additive Manufacturing at Massey University. He has expertise in automation and control engineering, cad/cam systems, flexible manufacturing systems, machining and mechanical engineering. His current research interests are mainly in areas of additive manufacturing and advanced mechatronics/robotics with applications in medicine and automotive related areas and he is currently conducting consulting research with HIEFF Engine and Chrysler in Detroit. He is widely published, including in international journals such as the International Journal of Computer Applications in Technology, Journal of Advanced Transportation and the International Journal of Intelligent Systems Technologies and Applications.